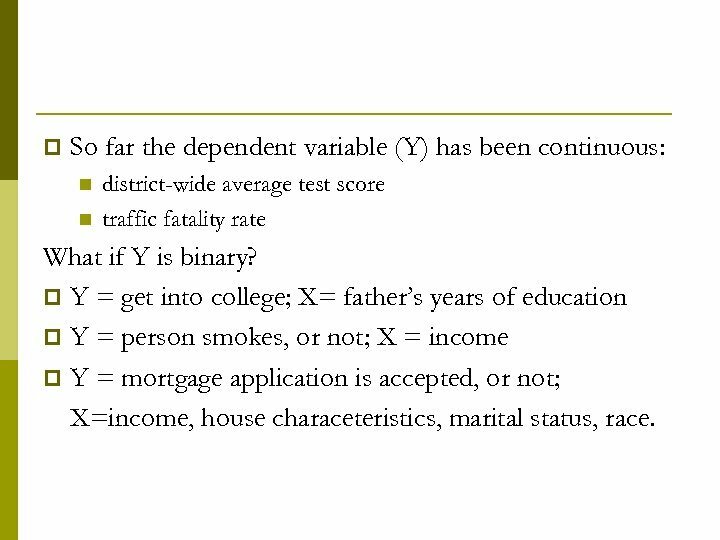 p So far the dependent variable (Y) has been continuous: n n district-wide average test score traffic fatality rate What if Y is binary? 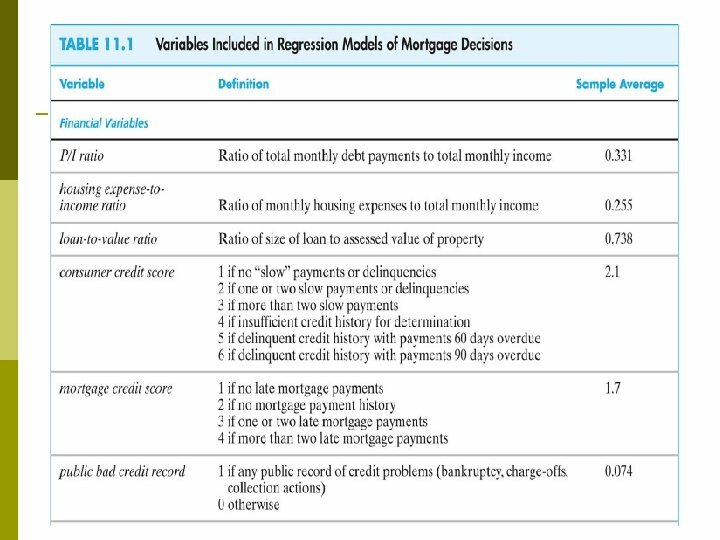 p Y = get into college; X= father’s years of education p Y = person smokes, or not; X = income p Y = mortgage application is accepted, or not; X=income, house characeteristics, marital status, race. 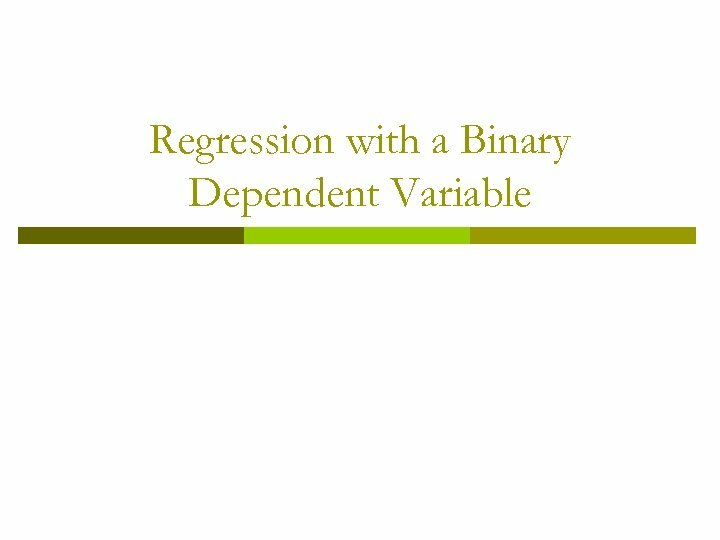 The Linear Probability Model p A natural starting point is the linear regression model with a single regressor: But, p What does mean when Y is binary? Is ? 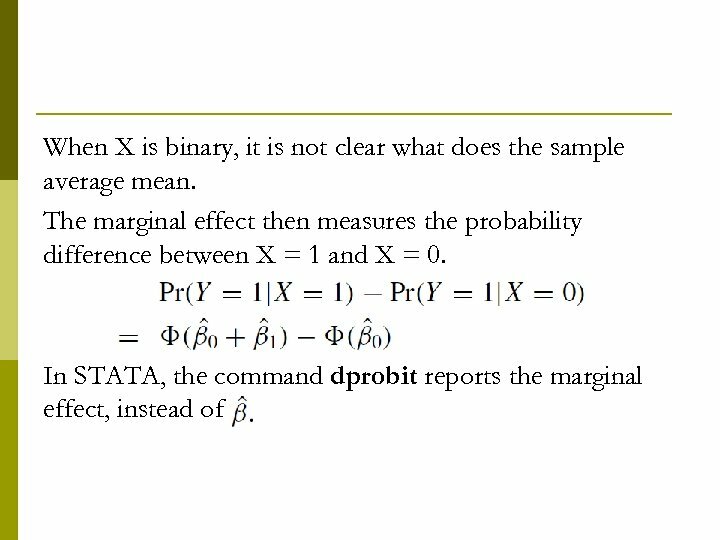 p What does the line mean when Y is binary? 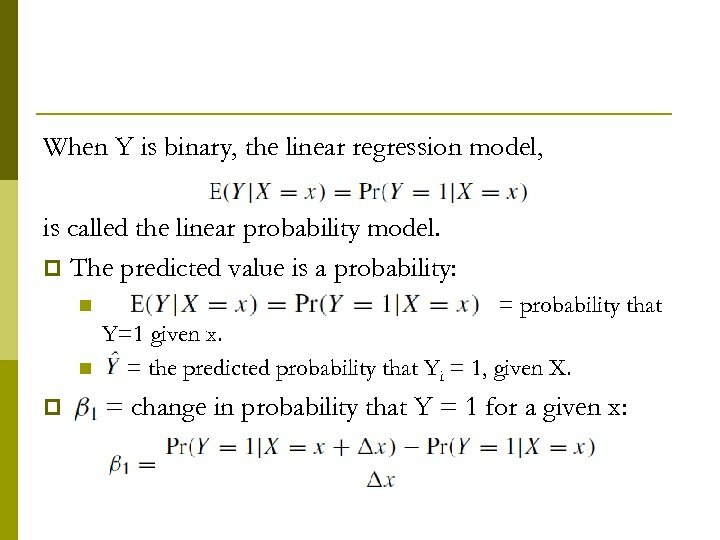 p What does the predicted value mean when Y is binary? For example, what does = 0. 26 mean? 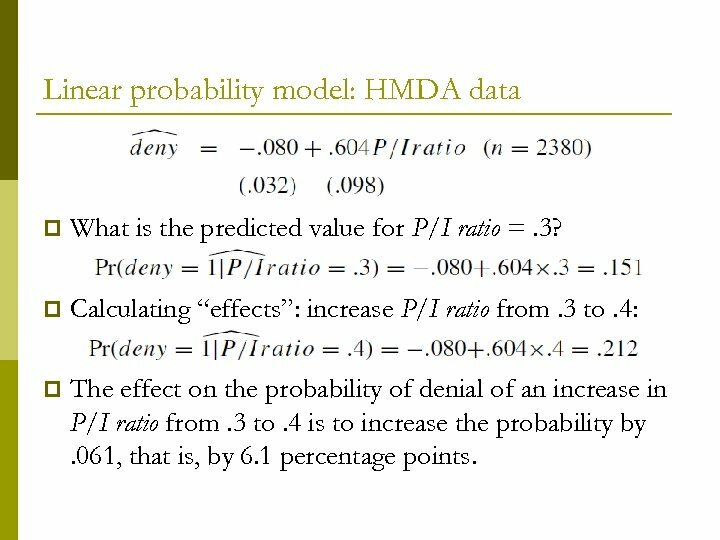 Linear probability model: HMDA data p What is the predicted value for P/I ratio =. 3? 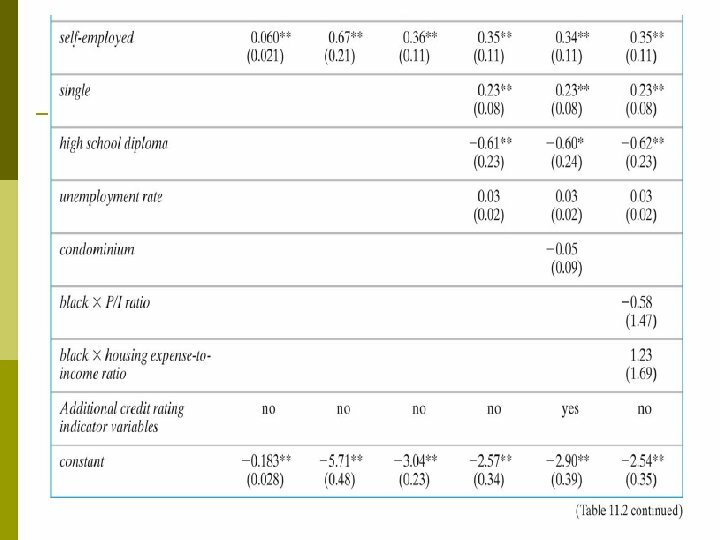 p Calculating “effects”: increase P/I ratio from. 3 to. 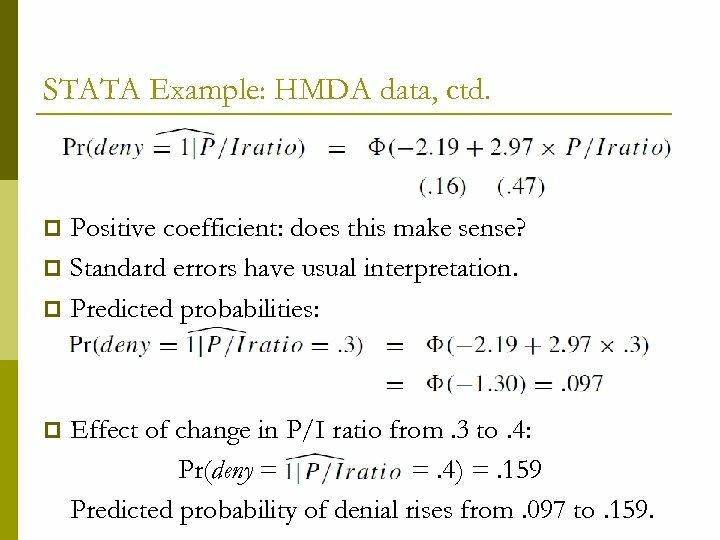 4: p The effect on the probability of denial of an increase in P/I ratio from. 3 to. 4 is to increase the probability by. 061, that is, by 6. 1 percentage points. 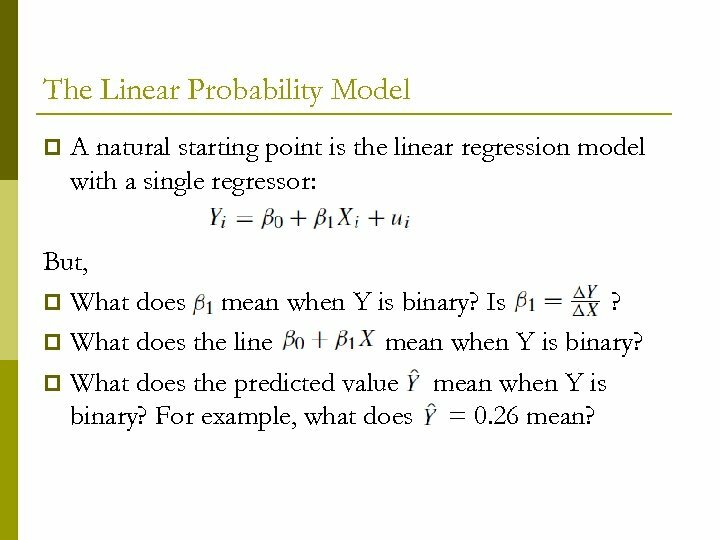 The linear probability model: Summary Models probability as a linear function of X. p Advantages: p n n p Disadvantages: n n p simple to estimate and to interpret inference is the same as for multiple regression (need heteroskedasticity-robust standard errors) Does it make sense that the probability should be linear in X? 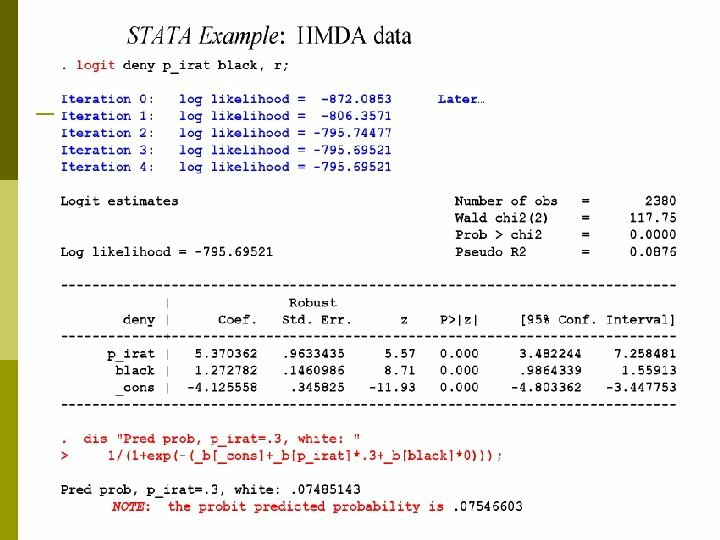 Predicted probabilities can be < 0 or > 1! 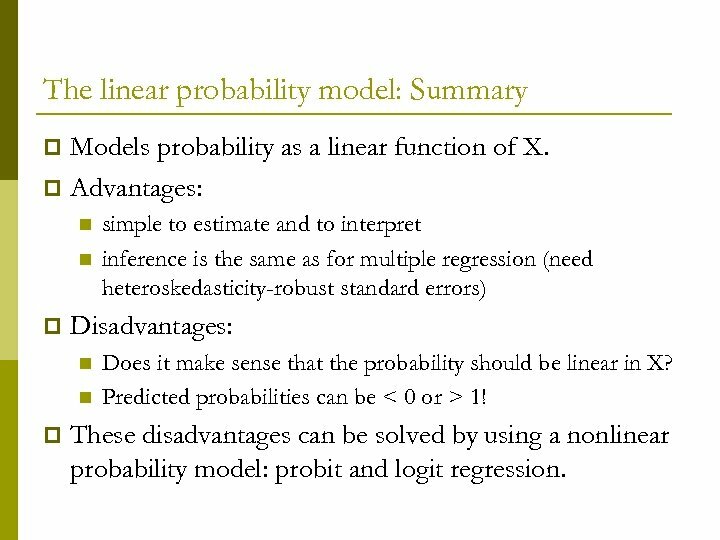 These disadvantages can be solved by using a nonlinear probability model: probit and logit regression. 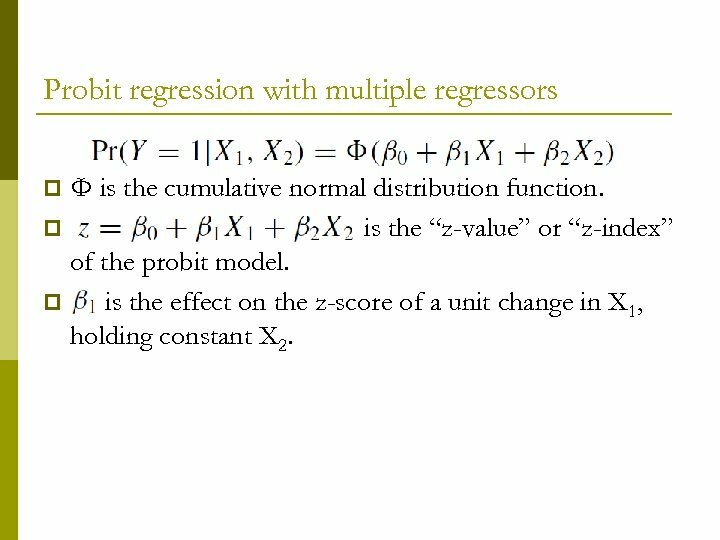 Probit and Logit Regression The problem with the linear probability model is that it models the probability of Y = 1 as being linear: Instead, we want: p 0 ≤ Pr(Y = 1|X) ≤ 1 for all X. p Pr(Y = 1|X) to be increasing in X (for > 0). This requires a nonlinear functional form for the probability. 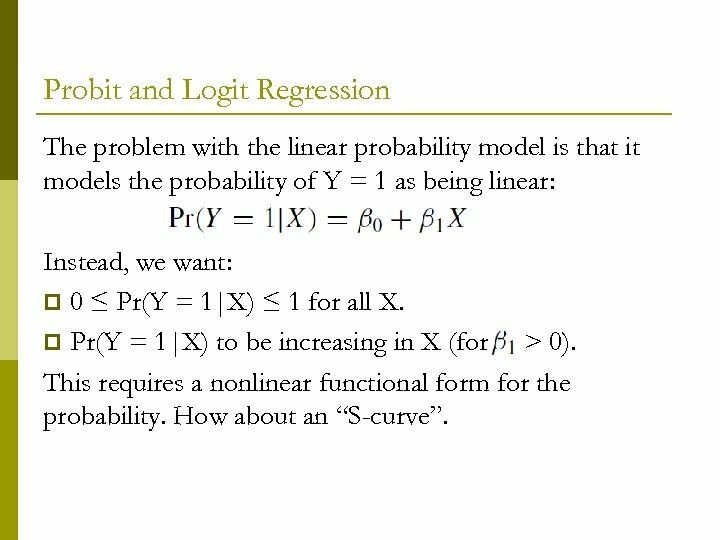 How about an “S-curve”. 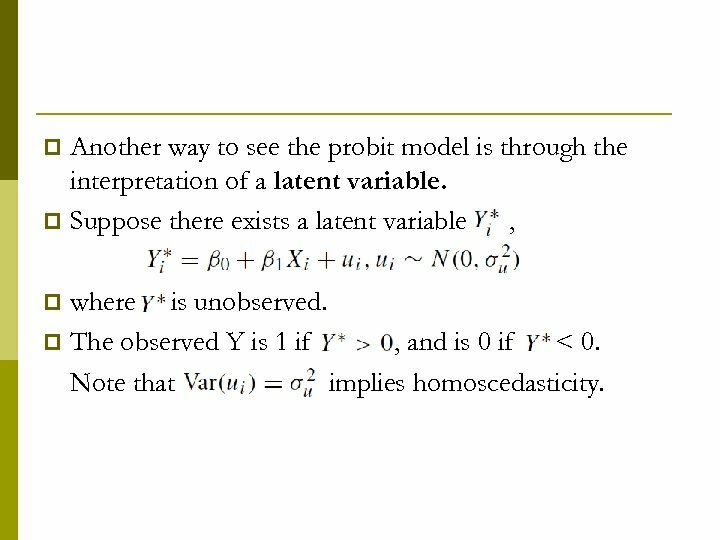 The probit model satisfies these conditions: p 0 ≤ Pr(Y = 1|X) ≤ 1 for all X. p Pr(Y = 1|X) to be increasing in X (for > 0). 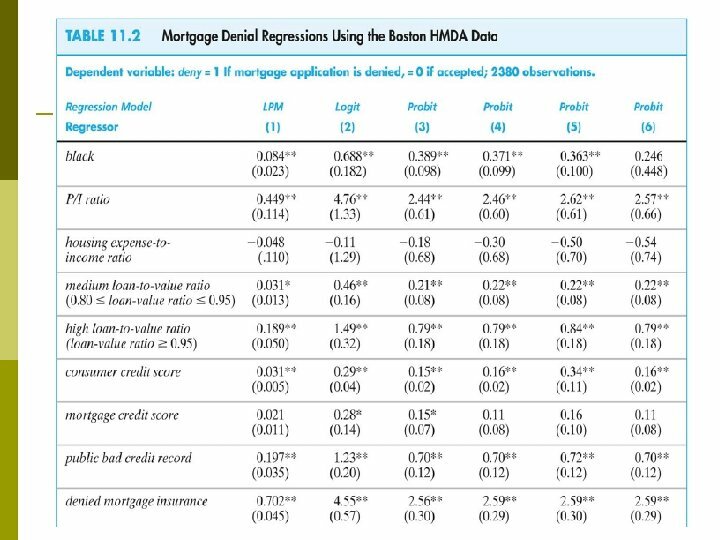 STATA Example: HMDA data, ctd. Positive coefficient: does this make sense? p Standard errors have usual interpretation. 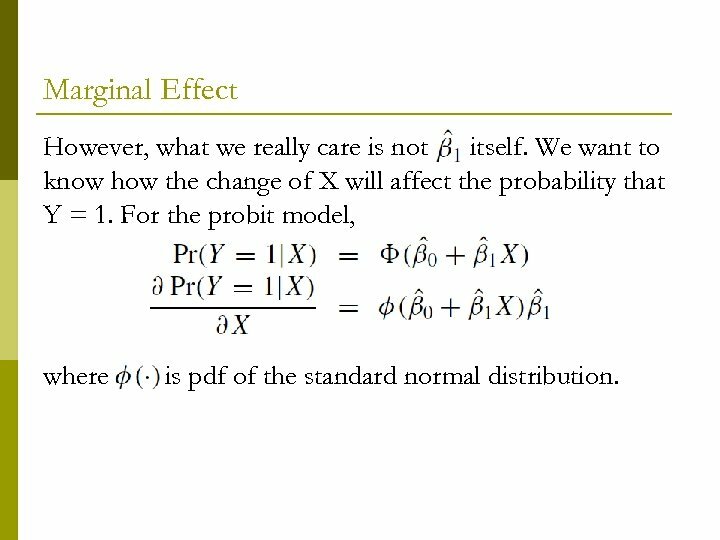 p Predicted probabilities: p p Effect of change in P/I ratio from. 3 to. 4: Pr(deny = =. 4) =. 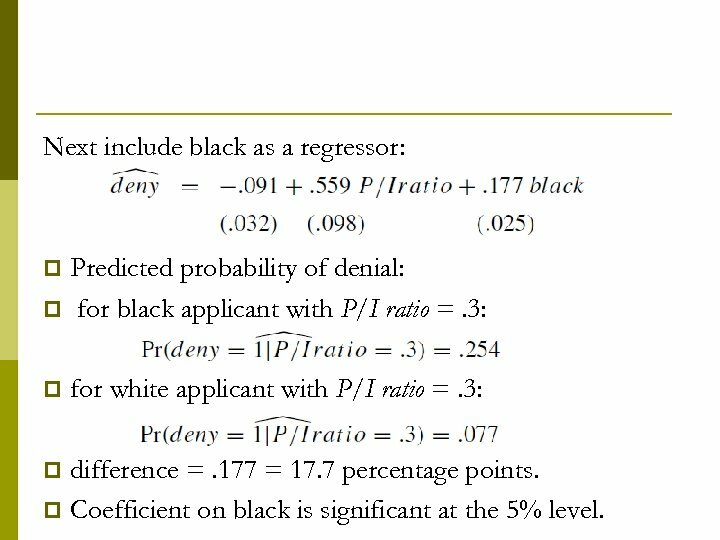 159 Predicted probability of denial rises from. 097 to. 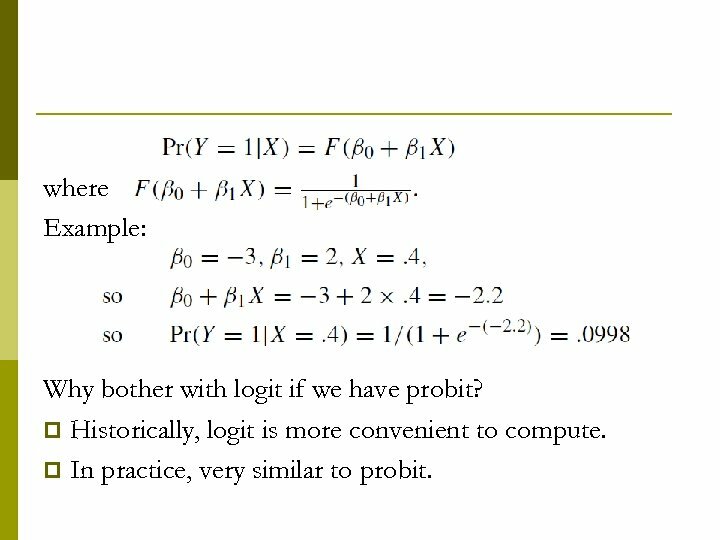 159.
where Example: Why bother with logit if we have probit? 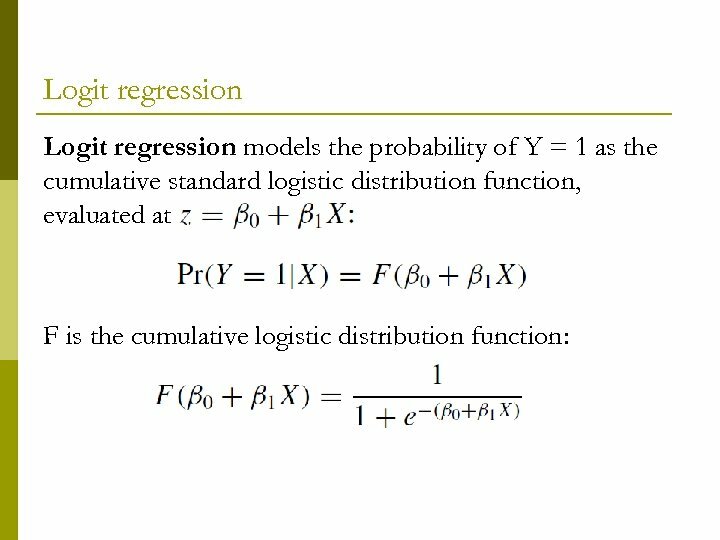 p Historically, logit is more convenient to compute. p In practice, very similar to probit. 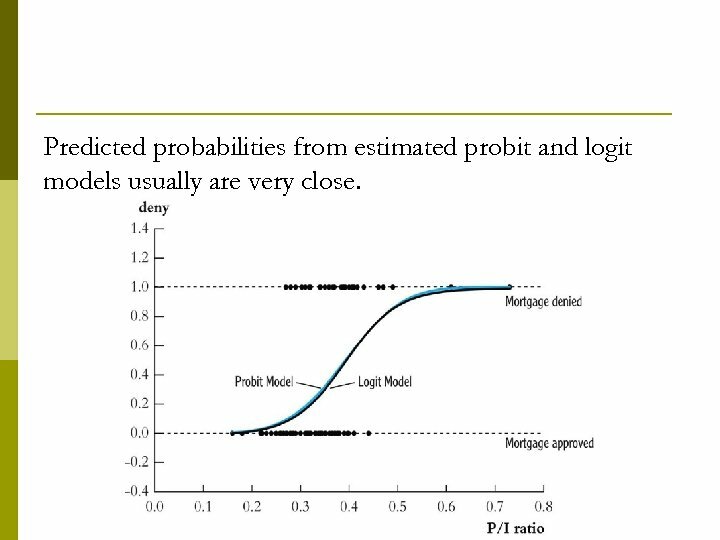 Predicted probabilities from estimated probit and logit models usually are very close. 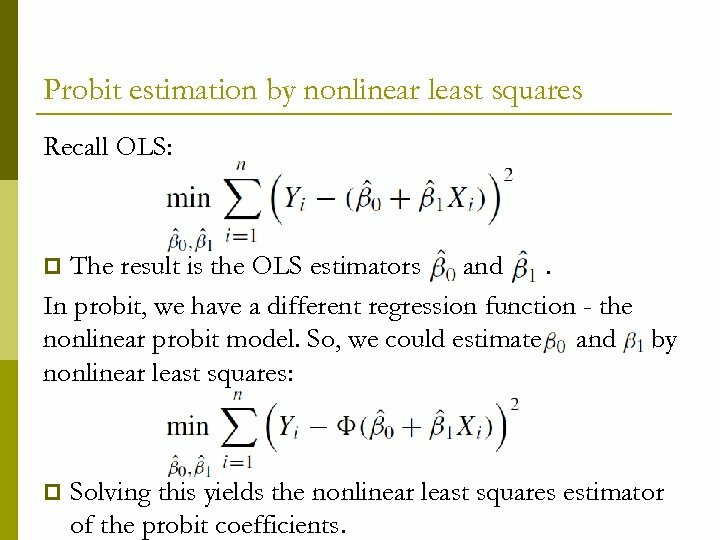 Probit estimation by nonlinear least squares Recall OLS: The result is the OLS estimators and. 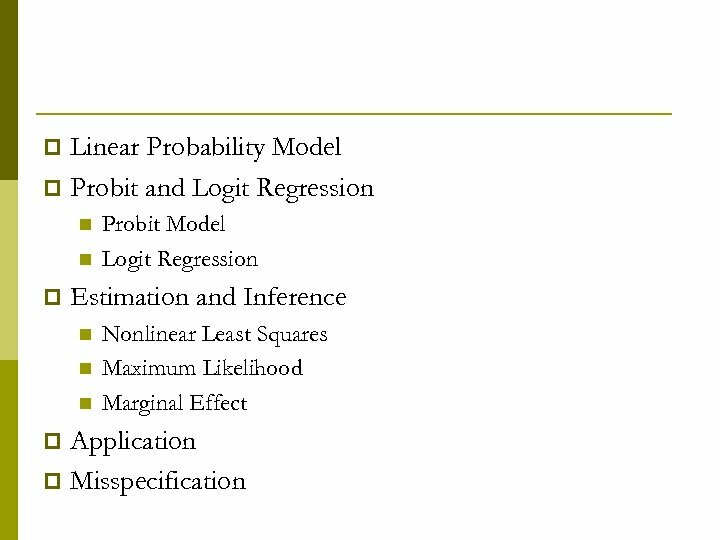 In probit, we have a different regression function - the nonlinear probit model. 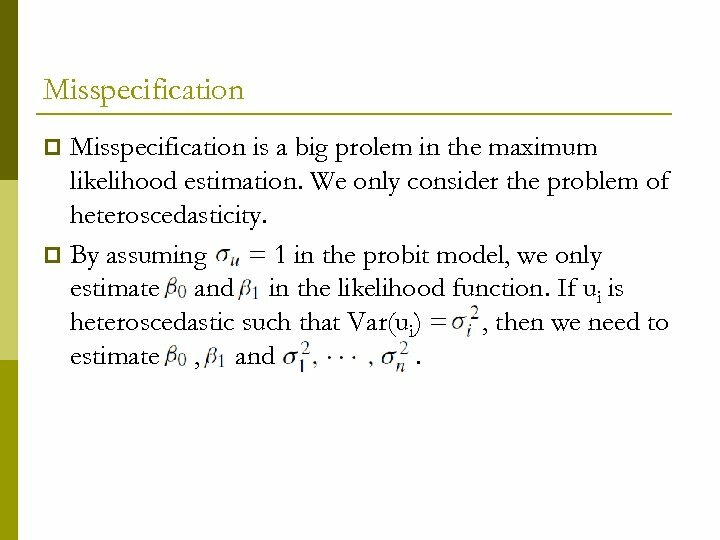 So, we could estimate and by nonlinear least squares: p p Solving this yields the nonlinear least squares estimator of the probit coefficients. 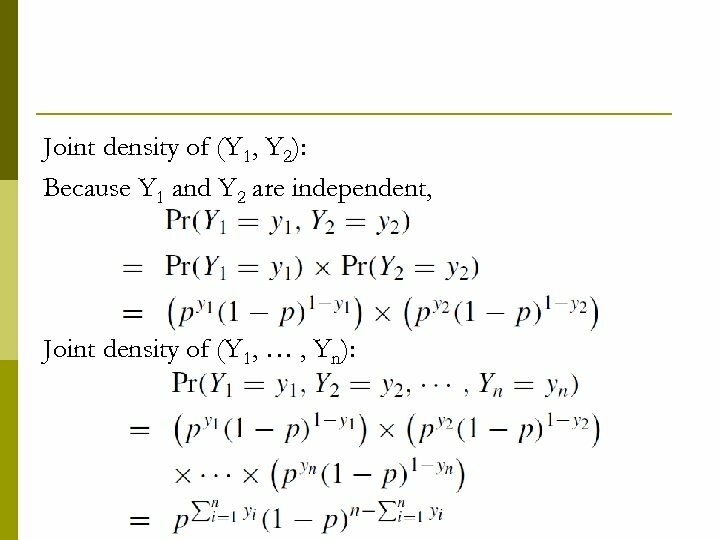 How to solve this minimization problem? p Calculus doesn’t give and explicit solution. p Must be solved numerically using the computer, e. g. by “trial and error” method of trying one set of values for O , then trying another, and another, . 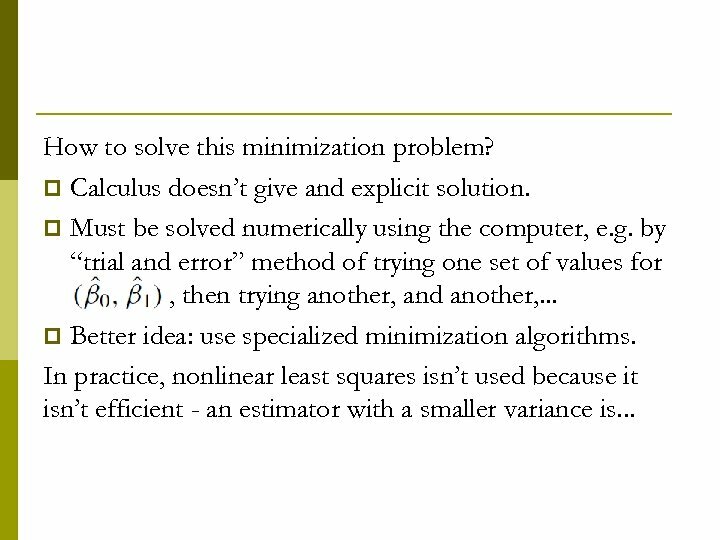 . . p Better idea: use specialized minimization algorithms. 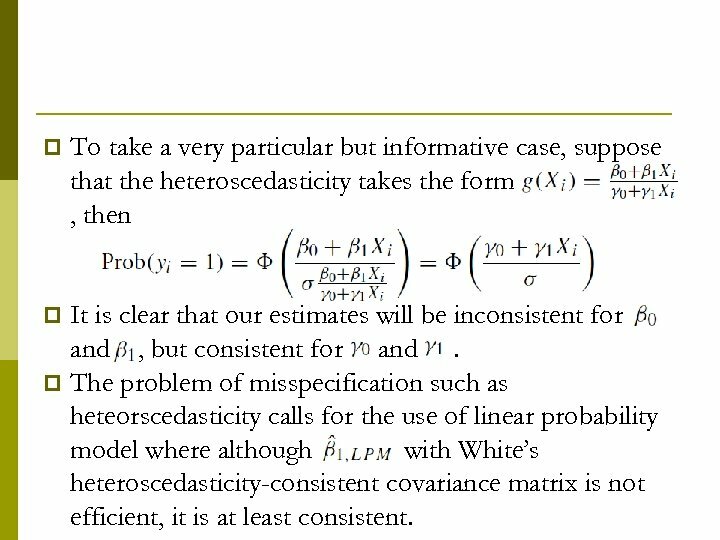 In practice, nonlinear least squares isn’t used because it isn’t efficient - an estimator with a smaller variance is. 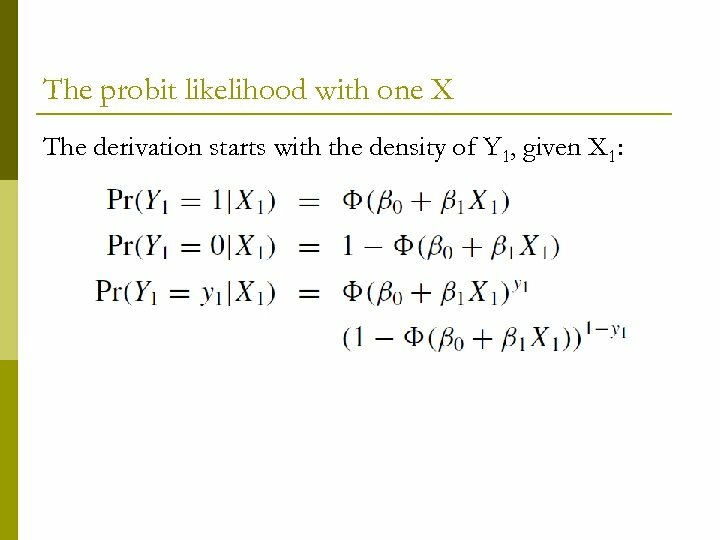 . .
Probit estimation by maximum likelihood The likelihood function is the conditional density of Y 1, … , Yn given X 1, … , Xn, treated as a function of the unknown parameters and. 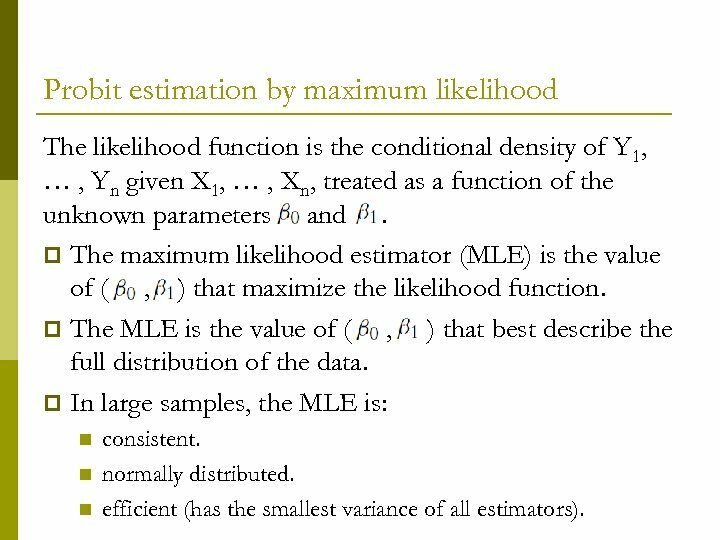 p The maximum likelihood estimator (MLE) is the value of ( , ) that maximize the likelihood function. 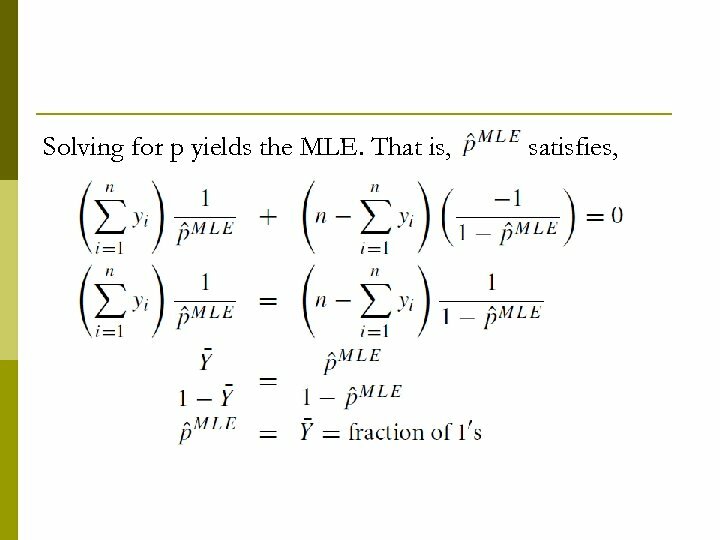 p The MLE is the value of ( , ) that best describe the full distribution of the data. 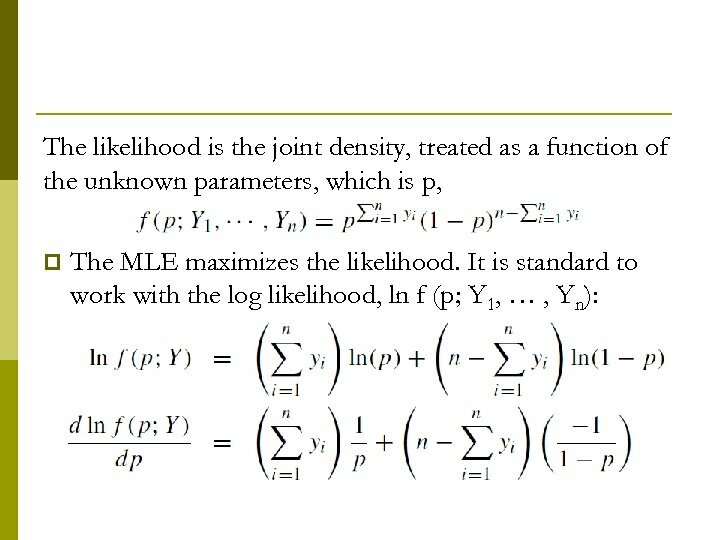 p In large samples, the MLE is: n n n consistent. normally distributed. 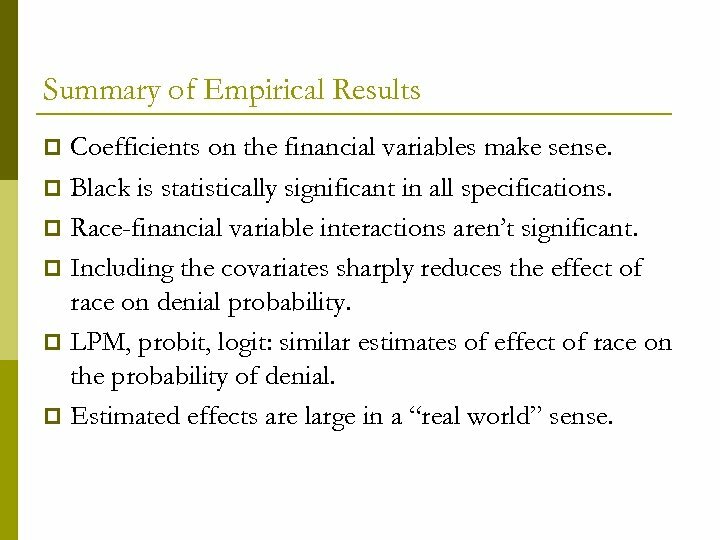 efficient (has the smallest variance of all estimators). 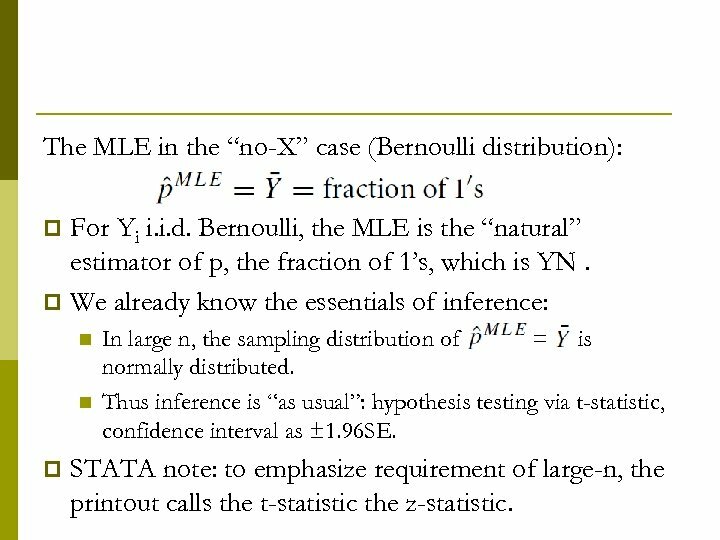 The MLE in the “no-X” case (Bernoulli distribution): For Yi i. i. d. Bernoulli, the MLE is the “natural” estimator of p, the fraction of 1’s, which is YN. 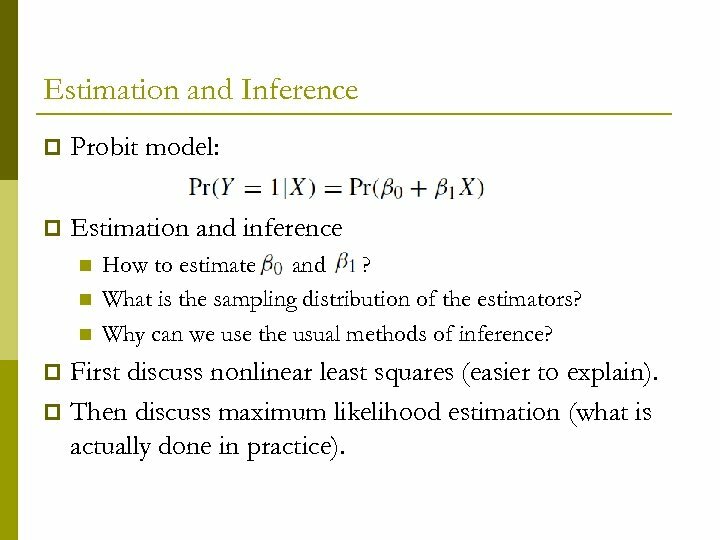 p We already know the essentials of inference: p n n p In large n, the sampling distribution of = is normally distributed. 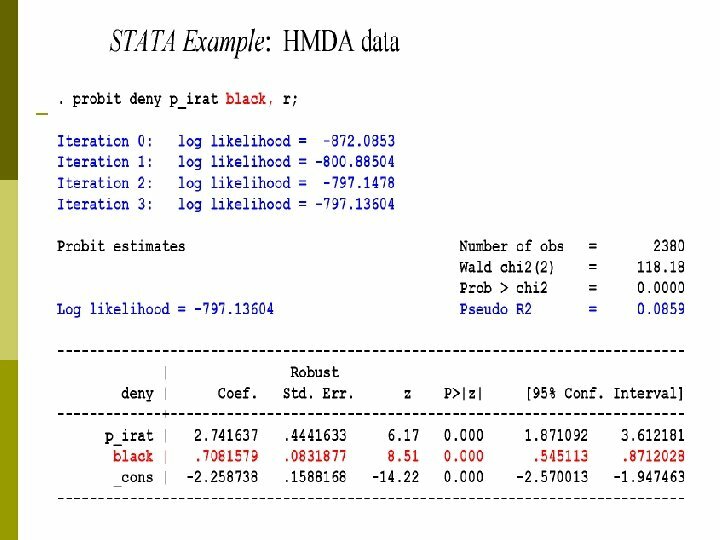 Thus inference is “as usual”: hypothesis testing via t-statistic, confidence interval as ± 1. 96 SE. 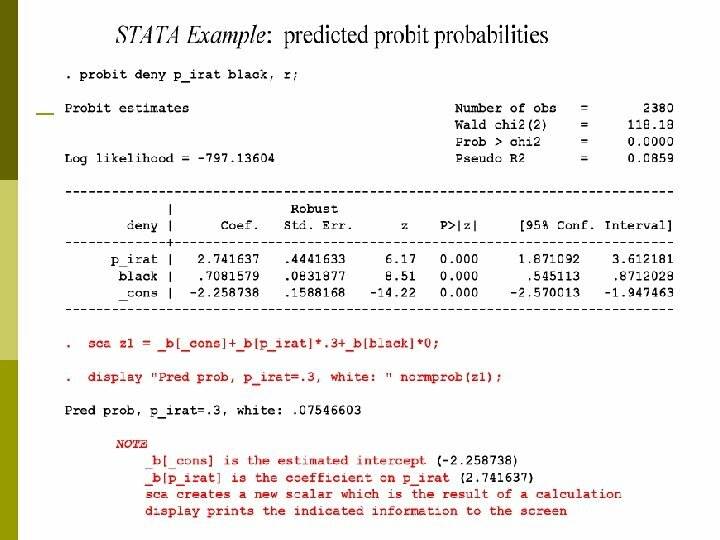 STATA note: to emphasize requirement of large-n, the printout calls the t-statistic the z-statistic. 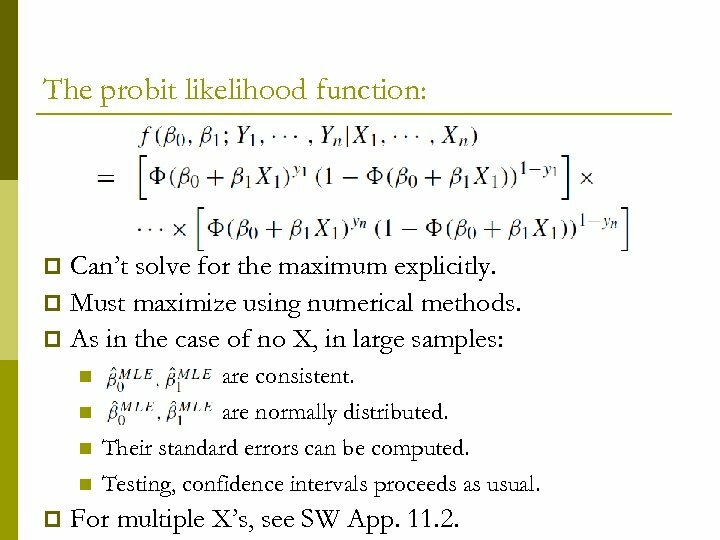 The probit likelihood function: Can’t solve for the maximum explicitly. 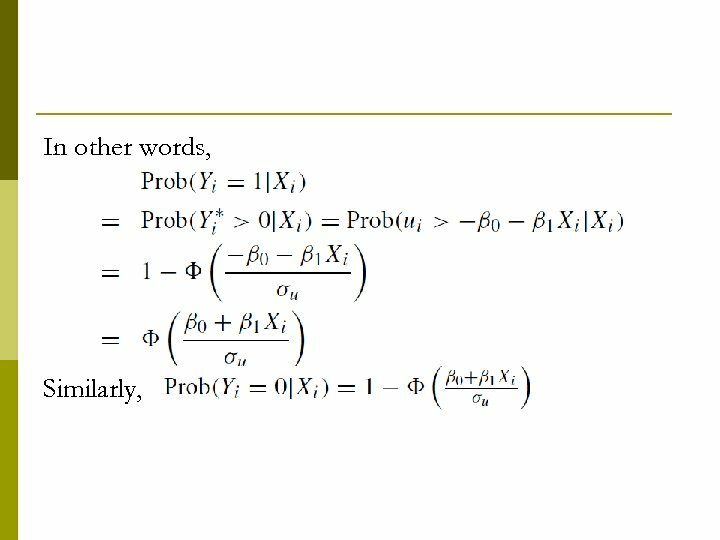 p Must maximize using numerical methods. p As in the case of no X, in large samples: p n n p are consistent. 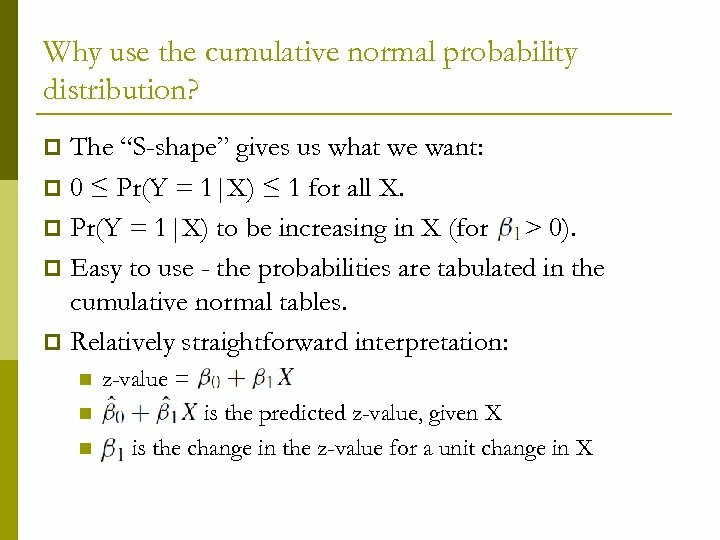 are normally distributed. Their standard errors can be computed. 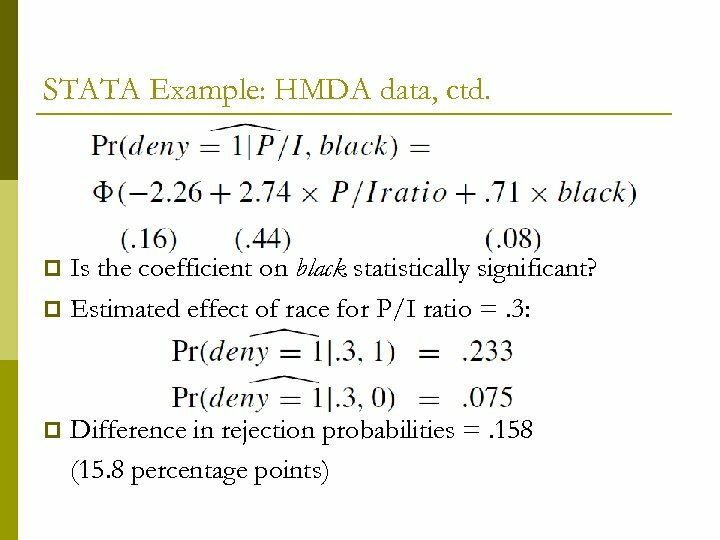 Testing, confidence intervals proceeds as usual. For multiple X’s, see SW App. 11. 2. 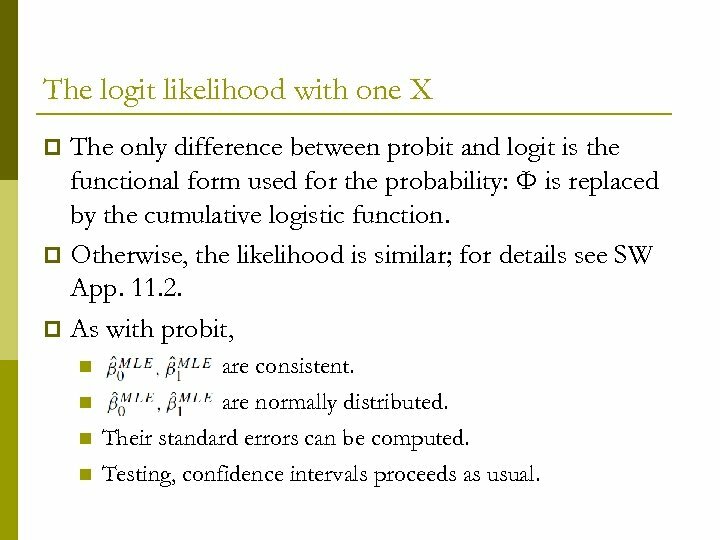 The logit likelihood with one X The only difference between probit and logit is the functional form used for the probability: Φ is replaced by the cumulative logistic function. 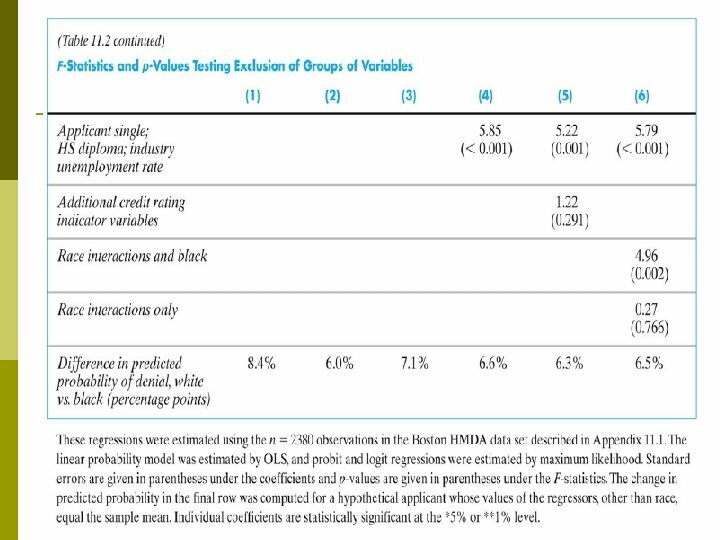 p Otherwise, the likelihood is similar; for details see SW App. 11. 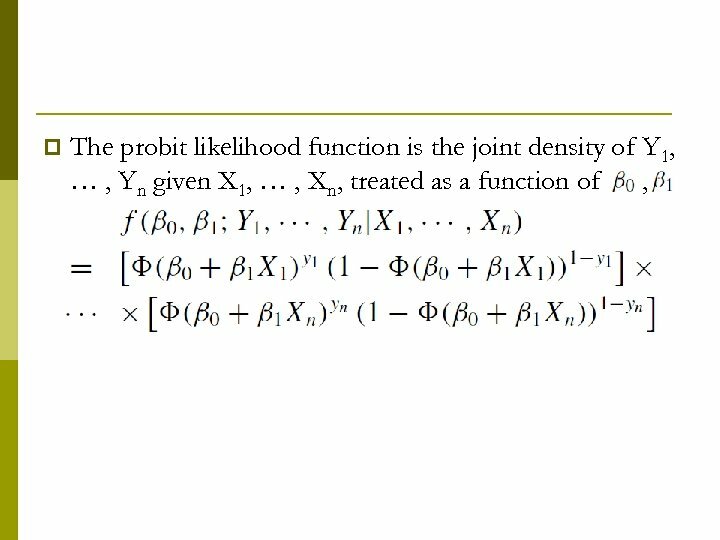 2. p As with probit, p n n are consistent. 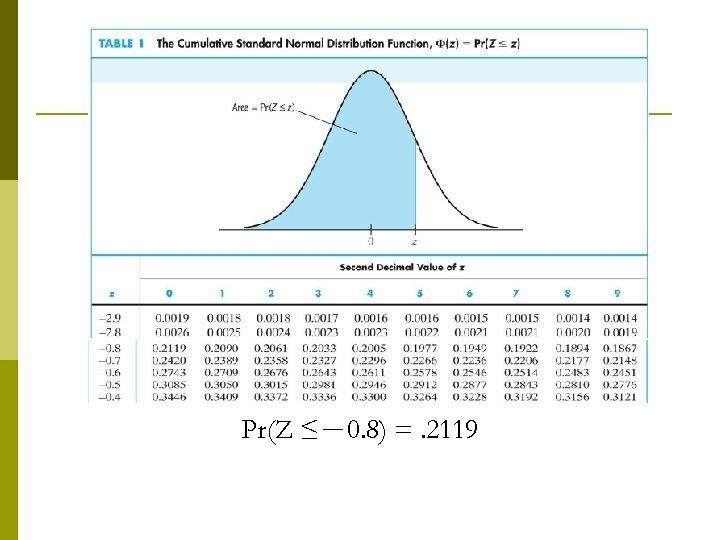 are normally distributed. Their standard errors can be computed. 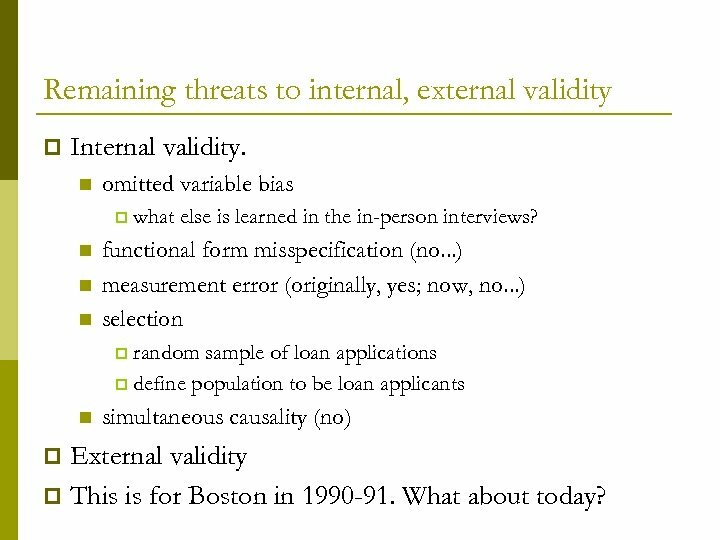 Testing, confidence intervals proceeds as usual. 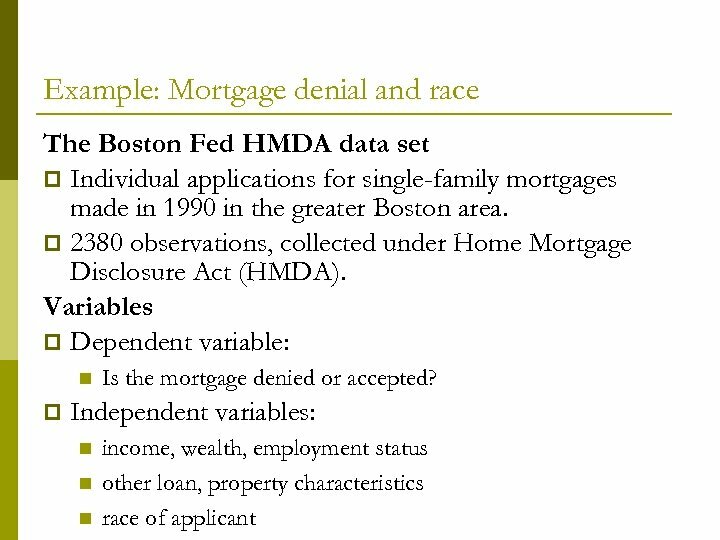 Measures of fit The and don’t make sense here (why? ). 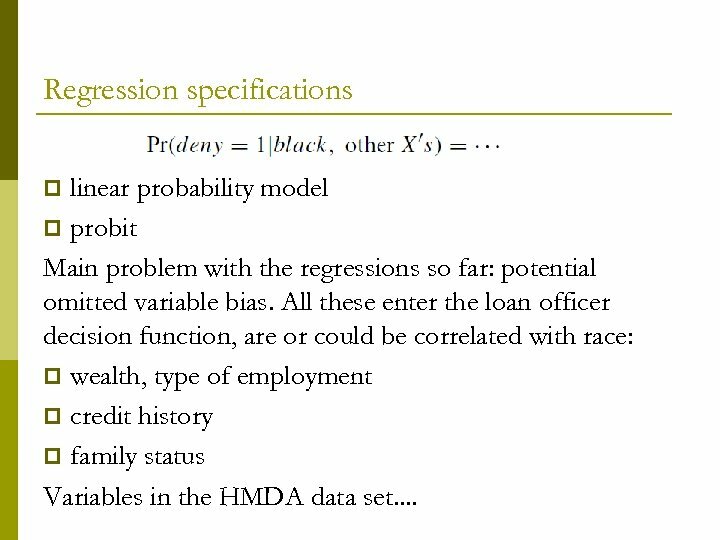 So, two other specialized measures are used: p The fraction correctly predicted = fraction of Y ’s for which predicted probability is >50% (if Yi = 1) or is <50% (if Yi = 0). 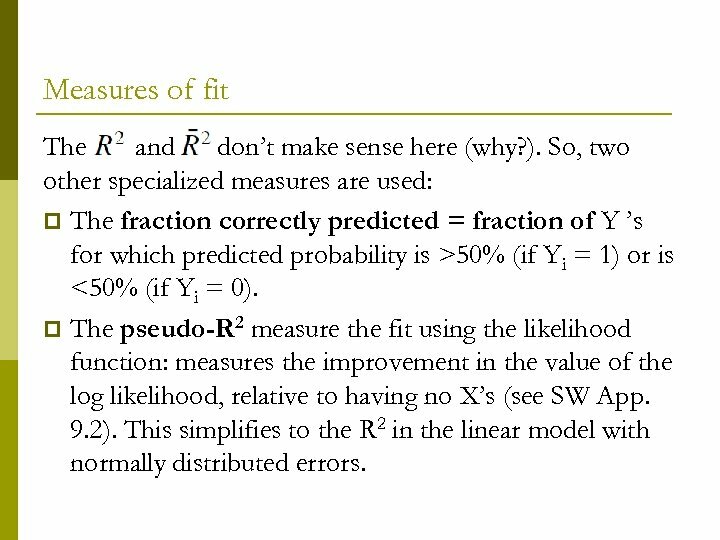 p The pseudo-R 2 measure the fit using the likelihood function: measures the improvement in the value of the log likelihood, relative to having no X’s (see SW App. 9. 2). 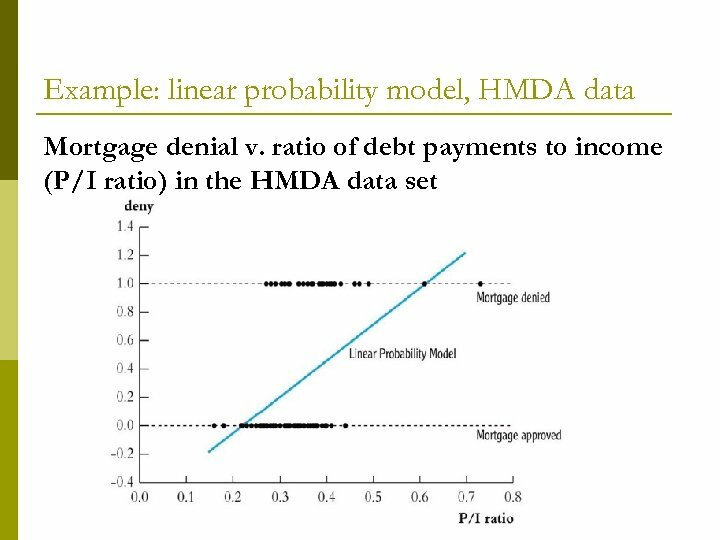 This simplifies to the R 2 in the linear model with normally distributed errors. Marginal Effect However, what we really care is not itself. We want to know how the change of X will affect the probability that Y = 1. 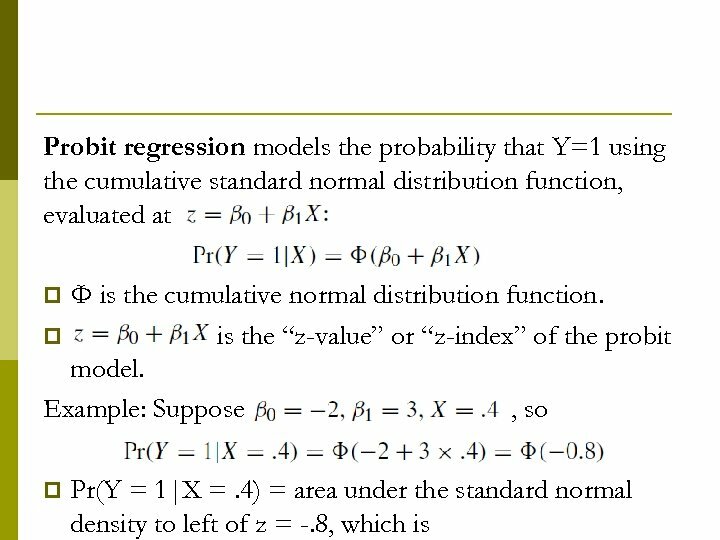 For the probit model, where is pdf of the standard normal distribution. 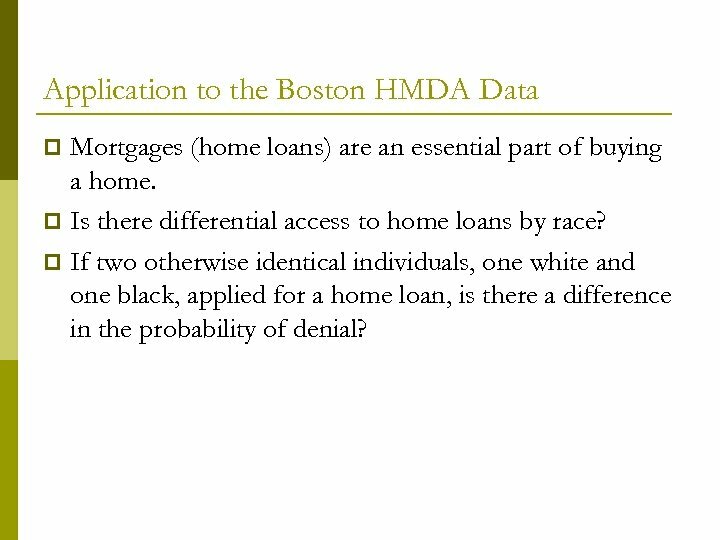 The HMDA Data Set Data on individual characteristics, property characteristics, and loan denial/acceptance. 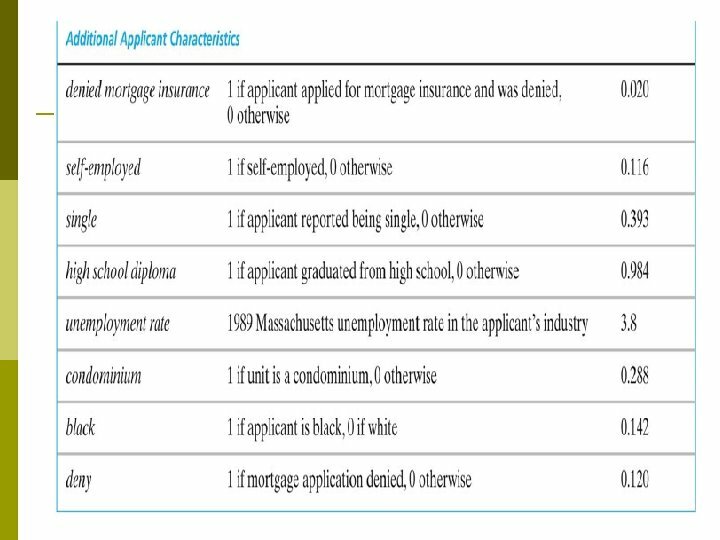 p The mortgage application process in 1990 -1991: p n n n p Go to a bank or mortgage company. Fill out an application (personal+financial info). Meet with the loan officer. 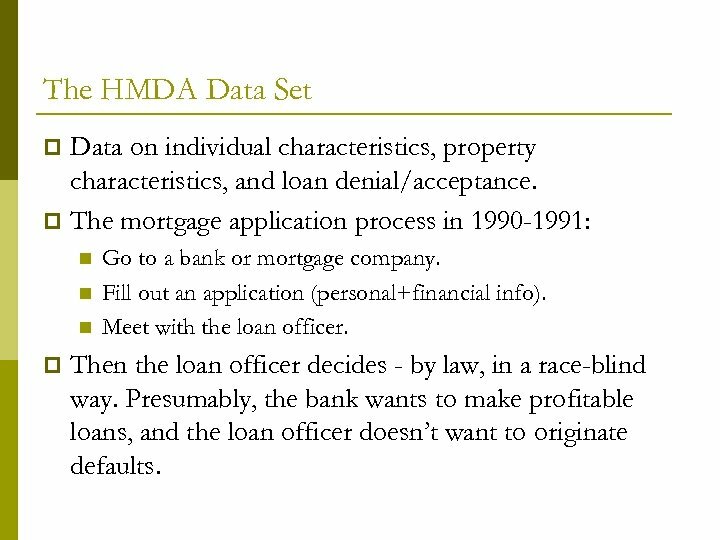 Then the loan officer decides - by law, in a race-blind way. 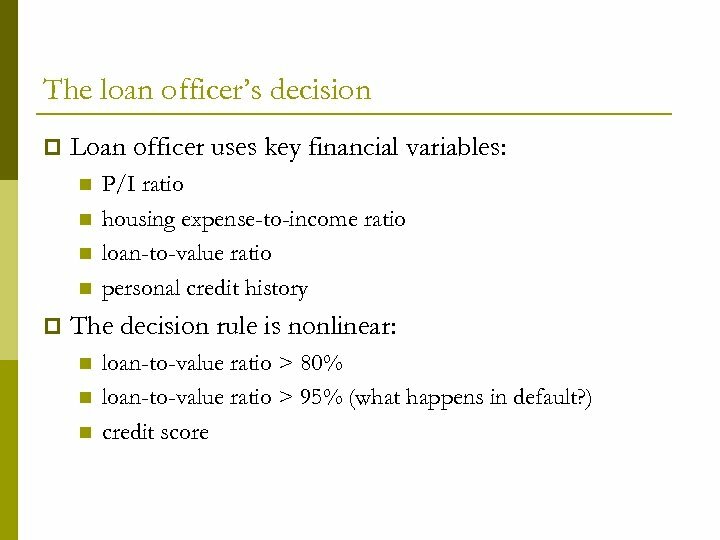 Presumably, the bank wants to make profitable loans, and the loan officer doesn’t want to originate defaults. 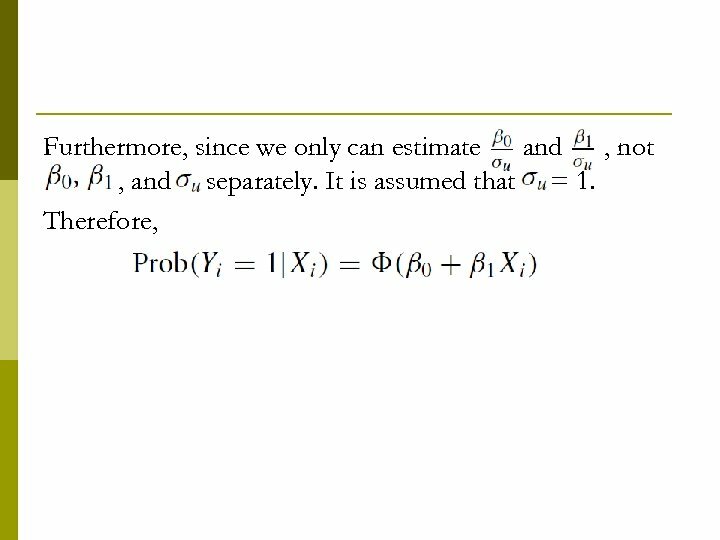 p But the problem can be more than increasing number of parameters to be estimated. 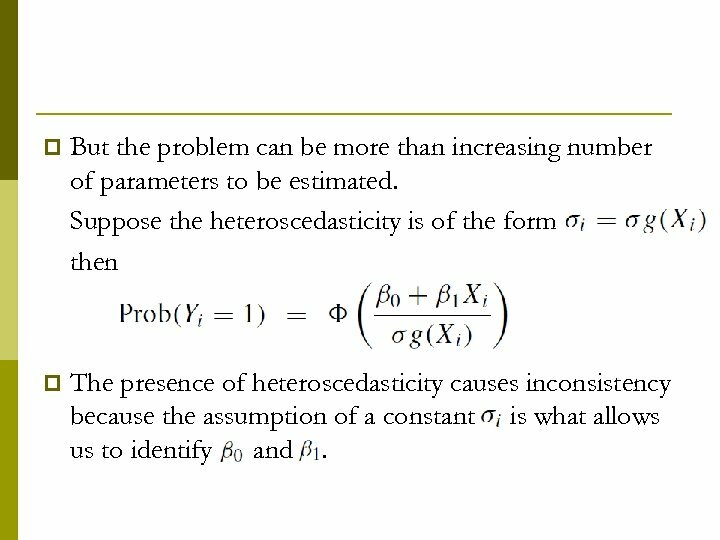 Suppose the heteroscedasticity is of the form then p The presence of heteroscedasticity causes inconsistency because the assumption of a constant is what allows us to identify 0 and. 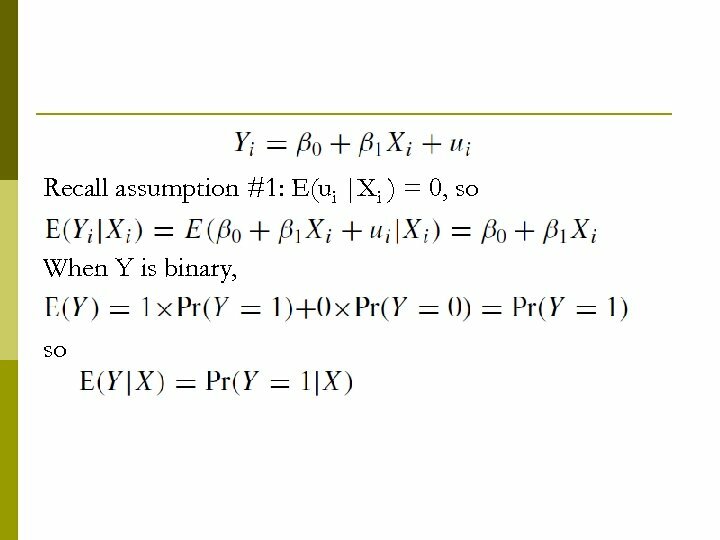 Summary If Yi is binary, then E(Y|X) = Pr(Y=1|X). 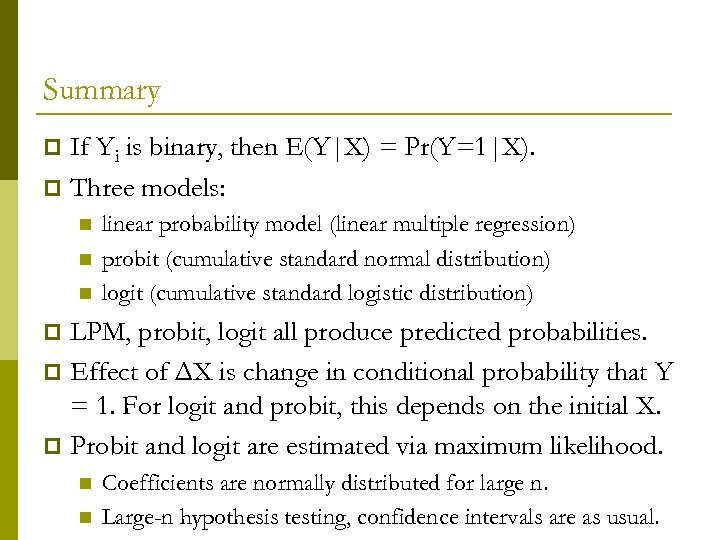 p Three models: p n n n linear probability model (linear multiple regression) probit (cumulative standard normal distribution) logit (cumulative standard logistic distribution) LPM, probit, logit all produce predicted probabilities. 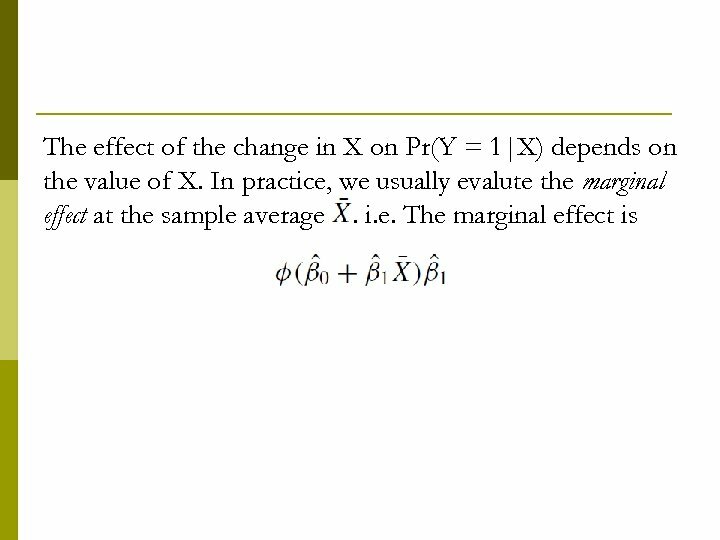 p Effect of ΔX is change in conditional probability that Y = 1. 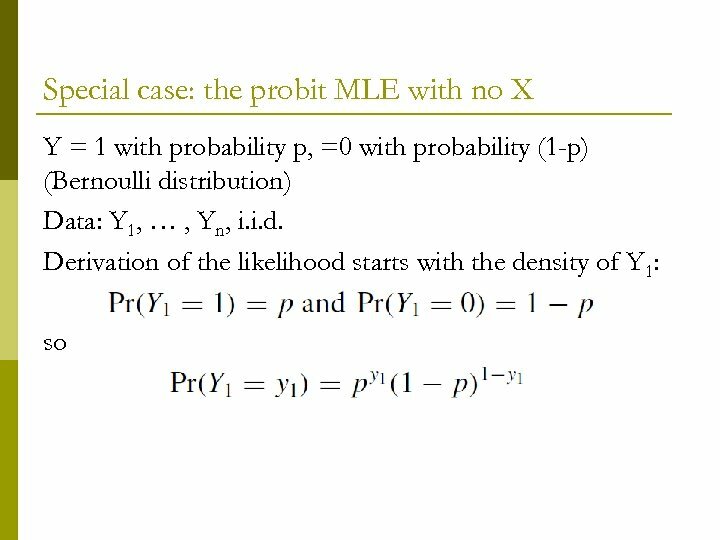 For logit and probit, this depends on the initial X. p Probit and logit are estimated via maximum likelihood. 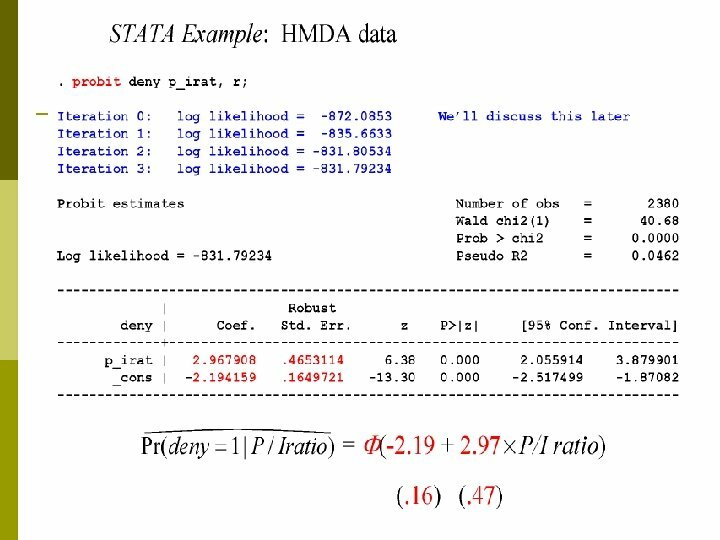 p n n Coefficients are normally distributed for large n. Large-n hypothesis testing, confidence intervals are as usual.